In the first two chapters of our tale, we explained how to differentiate AI from the buzzword and explored how the state of AI is currently only at a basic level. But not all artificial intelligence is created alike. More advanced AI, the kind that can deliver real results for your organization, is more than just a fairy tale. Of course, any kind of AI is capable of helping you. Automation can cut down on the monotonous tasks you’d otherwise have to do yourself, and chatbots can answer basic questions for you. But don’t you want to go beyond just helpful? There’s so much more that AI could be doing for you. 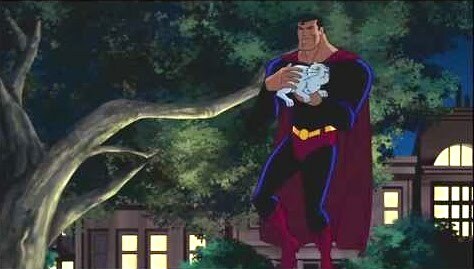 Superman Returns Lost Kittens – While flying around keeping a protective eye on Metropolis, Superman rescues a kitten from a high tree branch. After he returns the kitten to its grateful owner, he realizes this is a much safer career path than fighting crime. Spider-Man: Home Improvement – He may have superpowers, but Peter Parker is still a teenager who needs a summer job. The friendly, neighborhood Spider-Man starts his own business hanging his neighbors’ art on their walls using his webs. Ant-Man and the Wires – It can be tough for former convicts to find employment after getting out of jail, but not for Scott Lang. A local cable company puts him to work running cable wires through walls, which couldn’t be easier, thanks to his shrinking Ant-Man suit. Logan’s Diner – The mutant formerly known as “Wolverine” decides it’s time to retire. His passion for cooking leads him to open a restaurant. Due to his unique physical capabilities that make chopping vegetables a breeze, it quickly becomes known for its fast service. Guardians of the Gated Community – Deciding they should lie low for a while after finding themselves in trouble (again), Star-Lord and the gang take jobs as security guards in an upscale neighborhood. With a raccoon and a tree as part of the crew, they blend in easily with their suburban surroundings, stopping would-be burglars quicker than Thanos can snap his fingers (too soon…? 路‍♂️). Ok sure, superheroes using their powers in everyday ways is definitely helpful. But it doesn’t exactly AMAZE people in the same way as using their powers to stop a hostile alien race from destroying the planet (and it sure doesn’t shatter any box office records, either). Most artificial intelligence (what we’ve previously described as “basic”) works only from data pre-programmed into it. This allows it to perform simple, helpful tasks, but it can’t do anything more than what it is designed to do. By arming it with industry intelligence as well as situational context, advanced AI is capable of moving beyond this basic level. An example of this is image recognition software. According to TheNextWeb, image recognition “gives a machine the ability to interpret the input received through computer vision and categorize what it ‘sees.’” It further explains, “the way image recognition works, typically, involves the creation of a neural network that processes the individual pixels of an image. Researchers feed these networks as many pre-labeled images as they can, in order to ‘teach’ them how to recognize similar images.” It is only through humans manually embedding their own knowledge that image recognition software has been able to improve to the level it is at now. As a direct result of image technology becoming more advanced, autonomous vehicles are now a reality. Autonomous cars use computer vision to identify road signs, other vehicles, pedestrians, and obstacles on the road. Similarly, when it comes to achieving real business results, you want a software solution that’s autonomous. An autonomous AI solution is more than just a cool-sounding buzzword or basic automated AI (we’re talking to you, chatbots ). Just as you’d want Superman to do more with his powers than just rescue kittens, you want to make sure the AI in your procurement solution is working to the full extent of its “powers”. An advanced, AI-driven procurement solution can perform helpful tasks, like spend analytics, task automation, and supplier management – but its real superpowers occur when it goes beyond these basic tasks. It can categorize and enrich your data, give you enhanced visibility and insights into savings opportunities, and select the right suppliers that best meet your criteria. It also learns and works on its own – leading to improved outcomes for your organization. And it can do these things faster and better than any human or other type of less-advanced tech can. Sounds great, right? But there’s actually still a lot of skepticism around artificial intelligence, especially when it comes to business. If people are so excited about the possibility of riding in a self-driving Uber, why are they afraid to let it buy toilet paper for their business? By using an advanced AI solution for your organization, think about how much time you’ll have to do the things that you’re too busy for right now. Advanced AI can eliminate monotonous, manual tasks, allowing you to focus on being strategic. By streamlining your entire procurement process and saving time and money, you’ll be the real superhero at your organization. There are lots of poseurs out there, but advanced AI is already here for Xeeva. We hold multiple patents for the AI in our procurement and sourcing software. AI isn’t just a buzzword to us, it’s actual technology built into our software. For more about how AI is shaping the future of indirect procurement, check out our webinar! Superman is a registered trademark of DC Comics. Spider-Man, “friendly neighborhood Spider-Man,” Ant-Man, Wolverine, Star-Lord, and Thanos are registered trademarks of Marvel Characters, Inc.